They are unique to Bengal and you can’t miss them on. I was on a 9 days tour of West Bengal exploring the weaving traditions of the region.Uncut, often coiled hair, long, usually with a flowing beard, their saffron robe with a necklace of beads made of basil stems, crooning about love and compassion in ecstasy. It was straight from the heart and there was a hint of melancholy as well. 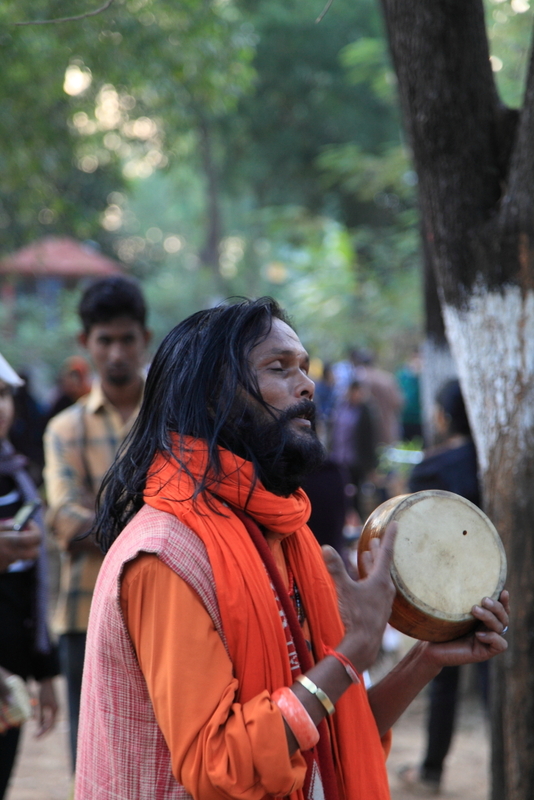 The first time I heard a Baul singing was at Shantineketan. I was there at the weekly fair held every Saturday. Although there were many things, all vying for my attention, I was rooted in that spot listening to him.There is a soul connection between the musical Bauls and the soil of Bengal. bind us. Begging for alms is a way Bauls enforce the fact that they should be happy with whatever comes to them. In each village there was a special house set aside for them to stay in and they would stay as long as they pleased. The language of their music is often called the ‘Twilight language’; the time of the day when boundaries blur with their songs having multiple interpretations with metaphors, codes and signs. Just like the sacred texts of Vajrayana Buddhism of the Tibetan tradition. But Bauls are non-conformists. Their simple, natural and direct approach to God has elements from devotional Hinduism, Tantric Buddhism and Sufi Islam. “We sing songs of joy, love and longing for mystical union with the divine and believe love for humankind leads to love for God” says Anand Gopal Das Baul. I met him at his ashram in Shantineketan; a small place with a central courtyard. “Bauls are simple but it is not simple to be a true Baul. You have to do years and years of sadhana (spiritual practice) under a Guru, who has the gift or the key to pass it on to you so that you can pass it on to others ” says Anand Gopal Das Baul. He led a life of an ascetic with his Guru for 10 years where 5000 songs were passed on orally as seeds of higher philosophy. Speaking to him I sensed that he was at peace and someone who had infinite patience. Leaving the ashram I thought if only there were more Bauls in the world, there would be less hatred and more peace all around.